Acting Attorney General Matthew Whitaker testifies before the House Judiciary Committee on Capitol Hill on Friday. 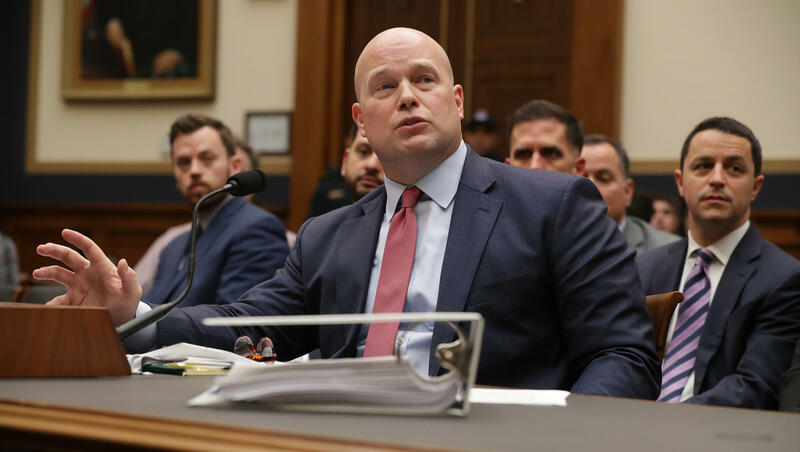 Acting Attorney General Matthew Whitaker vowed Friday that he hasn't interfered in any way with the investigation into Russian interference in the 2016 presidential election. Whitaker also told the House Judiciary Committee that although he's been briefed about the work of special counsel Robert Mueller, he has been the "endpoint" for all the information he's gotten and he hasn't discussed it with anyone at the White House. Whitaker told lawmakers he didn't want to talk about his conversations with President Trump but he did want to try to allay the concerns of Congress and the public that he has served as a mole for the White House inside the Justice Department. Whitaker said he hasn't denied funding or other requests for support from Mueller's office but resisted giving many details about the state of the inquiry today or his work within the Trump administration. And Whitaker also declined to stand by the skepticism he had voiced about the Russia investigation before he joined the Justice Department and the defenses he's offered of Trump. Rep. Andy Biggs, R-Ariz., asked Whitaker about a TV appearance in which Whitaker had said there was no evidence that Trump's campaign had colluded with the Russian interference or done anything else wrong. Biggs asked if he still held that view. "The special counsel investigation is ongoing," Whitaker said. "I'm not going to characterize that investigation or give my opinion of that investigation as I sit here today." The interim boss of the Justice Department initially looked as though he might not appear after trading salvos with the House panel's Democratic chairman, Rep. Jerry Nadler, D-N.Y., about the conditions under which he would testify. Whitaker was willing to travel to Capitol Hill and talk to lawmakers voluntarily, the Justice Department said — but not under subpoena, and he demanded a guarantee on Thursday that Nadler would not slap him with a subpoena at the hearing in the event he didn't answer a question. Nadler had threatened to do just that if committee members didn't get answers to questions they wanted; Democrats, who make up the panel's majority, voted to authorize a subpoena if necessary. Ultimately, the Democrats said they'd hold off, so long as Whitaker was prepared to appear before the judiciary committee on Friday morning. He did, and the session quickly became tense. It stayed that way into the afternoon. Nadler outlined the questions he wanted to ask Whitaker about how he got his job and about his involvement with the special counsel investigation. The chairman said that not answering would not be acceptable and that Whitaker might have to answer in a deposition after the hearing on Friday. "Your failure to respond fully to our questions here today in no way limits the ability of this committee to get the answers in the long run — even if you are a private citizen when we finally learn the truth," Nadler said. The committee's top Republican, Rep. Doug Collins of Georgia, blasted what he called Nadler's political theatrics and lamented what he called a pointless hearing — Whitaker's full-time replacement, William Barr, appears on track to be confirmed by the Senate next week. Whitaker was always an interim leader for the Justice Department, and it's pointless to conduct "oversight" of an attorney general with so little time left on the job, Collins said. All Democrats really want, Collins charged, is to try to hurt Whitaker and the president by putting on a show. "I'm thinking maybe we just set up a popcorn machine in the back," he said. Collins moved for the hearing to be adjourned — the way Democrats did in an earlier committee session with former FBI special agent Peter Strzok — but Nadler used his majority on the committee to keep it in session. Other Republicans also later attempted to use committee rules to stop the proceedings, as when questions turned toward Whitaker's work as a commentator before he came to work as chief of staff to then-Attorney General Jeff Sessions. Democrats used their control of the panel to press ahead. Although Deputy Attorney General Rod Rosenstein is understood to have continued overseeing the investigation after Trump elevated Whitaker, the acting attorney general said last month he's been "fully briefed" on Mueller's work and that he expected it to conclude soon. Whitaker told lawmakers that only he and a "very limited group" are read in about the work of the special counsel; only one of his staff members was present for their briefing, he said. Critics have said they worried about a hand-picked advocate for the White House sitting atop the Justice Department as it continues an inquiry that could have major consequences for Trump or others in his inner circle. Mueller's office is investigating whether anyone on Trump's campaign conspired with the Russian interference. The president and his aides say they've done nothing wrong. Trump opted to pass over Rosenstein, the Senate-confirmed deputy, and other Senate-confirmed leaders within the department in order to make Whitaker the acting attorney general after Sessions was forced to step down. Whitaker was a skeptic of Mueller before he came to work for the department, but he said his criticisms were based on the views of an outsider and that he's since gotten a better understanding of the case as acting attorney general. The longstanding practices of independence still apply, he said. "The department makes its law enforcement decisions based upon the facts and law of each individual case, in accordance with the established department practices, and independent of any outside interference," Whitaker said. Rosenstein also has tried to reassure people outside the Justice Department that irrespective of who is actually supervising the special counsel's office — whether him or Whitaker or Barr — the Mueller investigation would be handled "appropriately." The Senate Judiciary Committee voted on Thursday to recommend that the full Senate confirm Barr as attorney general, which could happen as soon as next week. Republicans control a majority in the Senate, and they've had at least one Democrat — Alabama Sen. Doug Jones — commit publicly that he too would vote for Barr. After thorough consideration, I have concluded that Mr. Barr is qualified for the position & his record strongly suggests he will exercise independent judgment & uphold the best interests of the DoJ. I will vote to confirm Mr. Barr as AG of the United States. Senate Majority Leader Mitch McConnell, R-Ky., has set the process in motion for a procedural vote on Barr early next week, possibly on Monday, with a final confirmation vote set for later. That would clear the way for Barr to return to Justice Department headquarters, where he served as attorney once already during the administration of President George H.W. Bush. Rosenstein is expected to stay in his No. 2 job for some period of time once Barr has taken his new role, possibly until Barr has had a chance to make his own choice of a deputy attorney general — a person who would then need to be confirmed by the Senate.